One of the most notable philosophers of the discipline of Stoicism, Epictetus was born in 55 AD to a slave woman in Hierapolis, a Greek city located in Asia Minor. Epictetus means ‘acquired’, which is a reference to his status as a slave during most of his youth. Epictetus and his mother were owned by Epaphroditus, who served as an administrator at Nero’s court. He spent most of his youth in Rome, but he had to leave Rome when Epaphroditus came into some disaccord with the Domitian’s government. 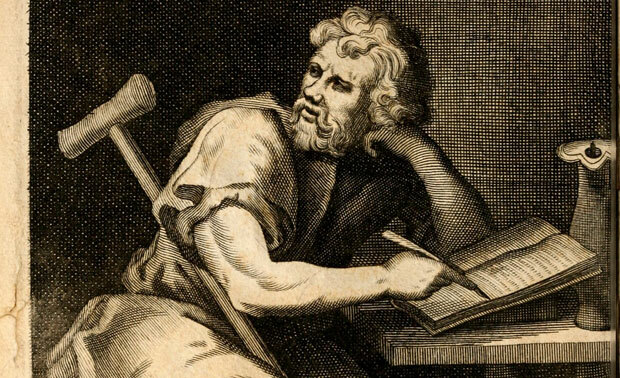 Epictetus was not treated harshly by his master, in fact, he was allowed the exclusive privilege to pursue education, and due his master’s influential social status, Epictetus benefitted from the tutelage of Musonius Rufus, an influential philosopher of the Stoic discipline. Upon gaining his freedom, Epictetus began teaching philosophy and constructing his own ideologies. In 89 AD, Domitian exiled all philosophers from Rome, hence, Epictetus was forced to leave his native city as well. He settled in Nicopolis, in Northwest Greece and founded his own school. In Nicopolis, Epictetus found the fame that was denied to him in the constricting atmosphere of Rome, it is said that his influenced even transcended that of Plato’s. His institute was frequented by the most eminent Roman philosophers, and his students included affluent citizens such as, Flavian Arrian. Arrian is also largely responsible for collecting, compiling and editing the works of Epictetus, which, despite his painstaking meticulousness remain partial and incomplete. Epictetus’ works have been conveyed to the masses mainly through the efforts of his pupil, and it is still widely debated whether the works were his own or that of his Flavian Arrian. His works can be found in the eight books of the ‘Discourses’ and ‘Encheiridion’, however, his theories appear as scattered and uncoordinated due to their disorganization. The Discourses contains his theories on a wide range of diverse subjects such as fear, poverty, illness and anger. Epictetus’ philosophies provide the approach to construct a fulfilling and peaceful life, to continuously improve the circumstances and essence of one’s existence, and to excel in one’s abilities. Epictetus introduced the concept of achieving eudemonia to the Stoic school of philosophy, which can be literally translated as flourishing and refers to attaining a state of contentment and blissful satisfaction. The Encheiridion, also called The Handbook in English, provides discourse on day-to-day events that we all encounter, and basically serves as a simplification of the philosophies put forward in the Discourses. It talks about free will and power, and explains power as a course of action taken towards circumstances, for fulfilment of desires and to create diversions. It goes on to advocate that our body, property, official positions, and reputations are not within our power and thus subjected to restrain and the power of other individuals, whereas the things that lie within the sphere of our power are free by the course of nature. Epictetus proposes that if one assumes that the things which lie outside our power and are subjected to the authority and command of others, are actually controllable and can be manipulated, one will suffer from hindrances, difficulties and will eventually end up blaming one’s fate and society. However, if one is able to distinguish between the affairs that our controllable and the one’s that can be subjected to our authority, one can form a balance in life, and be able to lead life with free will and without any disturbances. For centuries, the teachings of The Handbook have served as a guide for Christians and Pagans alike. Epictetus’ mainly dealt with the construction of a moral philosophy that could aid mankind in the construction and improvement of a better life. He wanted his teachings to practical and rational, yet at the same time, they provided individuals with tools of moral consultation and self-reflection. Epictetus placed much emphasis on the strong development of character, and believed that fear creates hindrances, therefore, humans should not attempt to change things that cannot be changed. His teachings preach that while externalities are unchangeable, the internal of an individual is subjected to constant change and development, and the circumstances that create fright and panic, can be altered from unfavorable to favorable, depending on how they are dealt with. He further stated that humans are not fearful of events or circumstances, but rather the conceptual framework of the events and the terror that accompanies with the understanding of their notions. And one can only overcome his fears if he takes control of his emotions, instructs himself and does not give in to fear by acting rationally. Epictetus’ philosophical contributions have played a vital role in the evolution of the Stoic school of philosophy. His work had influenced the masses for centuries, and was also adopted by Emperor Marcus Aurelius as the central doctrine of his empire.